Please read our returns policy before making a purchase with us to ensure that you have a clear understanding of our refund policy and whether you have a right to cancel your contract with us. If you are are not satisfied with the products you have received you have up to 14 days from receipt of delivery to return the goods and receive a full refund. You are responsible for paying the full cost of returning the goods and all the goods must be returned in perfect condition and must not be used. You are allowed to unpack the goods and inspect them as you would in a shop but to obtain a refund you must not start using them. All packaging that you received with the goods must also be returned in an ‘as new’ state. Refunds will only be processed once we have received the goods backs in perfect condition. A refund to the value of the goods will be issued within 30 days of the receipt of returned items. We reserve the right to make a deduction from the refund for any loss in the value of goods if the loss is the result of unnecessary handling by you. Our returns policy is in accordance with the EU Consumer Rights Directive. Within 14 days of receipt of goods you must email us at info@dormer.ie quoting your order number and your intention to return the goods. You can also use the cancellation form found here and email this to us. What Happens if Products are Faulty? If you receive products that are damaged or faulty you must notify us within 24 hours from receipt of delivery. 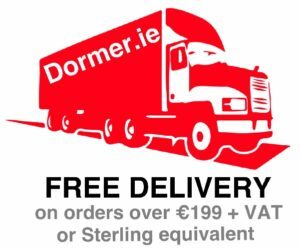 Please email us at info@dormer.ie and include your order number and the issue you have. Please note that we may ask you to check the goods to confirm the fault or ask you to carry out a telephone diagnostic to make sure it is not a problem that can be resolved quickly.